Let’s be honest, the Democrats yet again lost this race just as much as the Republican’s won this race. I had done a two posts in the weeks leading up to this election night that clearly showed the Democrats had the better track record and actually had something to produce than just being morally right on some issues. The 111th Congress passed the the most broad-sweeping policies since the Great Society days of the 1960s when it came to healthcare. This combined with the fact that Obama had weathered everything that the the Republicans threw at him and even survived the grand debacle that was the BP Gulf Oil spill. And still, the Democrats didn’t get a clue until October — just a month out. rical campaign. The GOP knew that back in the 1970s with Nixon and the Vietnam crisis. They perfected it with the proper use of fear. And a lot of it. Fear used properly is a good thing for a political candidate and their party. The GOP knows it and uses it when need be. In the 1980s it was the Moral Majority that had Christians thinking the world was going to hell in a handbasket if they didn’t vote Republican. 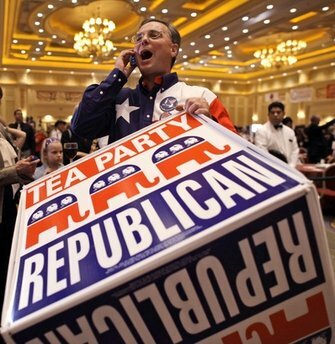 Nowadays its the Tea Party that has Christians thinking the world is going to hell in a handbasket if they don’t vote Republican. The Democrats lost the rhetorical battle long before October. This was because of a slightly aloof President. I know it’s not super popular to say that, but I think Obama could have made some better PR decisions back during the BP Oil Spill that might have paid off in the polls. Certainly the hoopla surrounding his birthday when Michelle Obama went to Spain didn’t help the situation at all. That in addition to the fact, it seemed as though the Democrats that were running against the much flashier GOP nominees supported by the Tea Party. We became sadly familiar with the names of Christine O’Donnell from Delaware, now Senate-elect Rand Paul from Kentucky and Sharron Angle from Nevada and knew nothing of their Democratic counterparts. For that I blame mainstream media. Especially FoxNews. FoxNews is a national bullhorn for Tea Party mouthpieces to spew their venom with foolish hosts like Bill O’Reilly and Sean Hannity and Glenn Beck. So what happens is that when the Tea Partyers in collusion with FoxNews “report” on the various candidates, it puts Rachel Maddow and Keith Olbermann in reaction mode; always having to respond to the latest FoxNews lie. This, as most of us know it, fundamentally has been what’s wrong with the Democratic party: it’s always responding to something or someone and never steering the debate for themselves. Again, same ish, different day. 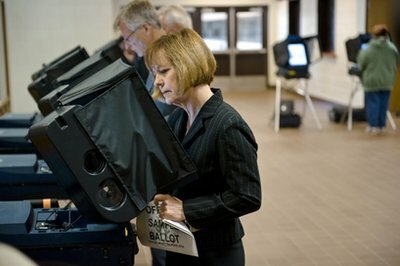 As local elections here in Illinois and here in countywide elections went the way I voted, (except for the U.S. Senate race going to GOP Mark Kirk and not Alexi Giannoulias), I must admit watching U.S. Rep Michele Bachmann-R. from Minnesota speak about the Tea Party Caucus being formed scared me. I’m convinced that the Tea Partyers went to Trent Lott to get Strom Thurmond’s 1948 campaign on the States’ Rights’ Democratic Party playbook. And yes, this is the same movement that was known as the Dixiecrats who ran heavily on the segregationist platform. Hearing the Libertarian leanings of Rand Paul concerning the repealing of parts of the 1964 Civil Rights act to hearing Sharron Angle make pleas for removing whole government departments — all under the guise of “taking back” the country seems like something out of the Jim Crow South. While poll numbers are preliminary as far as actual statistics of who voted with demographic breakdowns, black folk need to be honest with ourselves that for the most part we’re in the same position on November 3rd that we were on the morning of November 2nd before the faithful few of us trekked to our nearest polling place. This is not to stoke the embers of apathy and disturb the wasps’ nest of disillusionment, but rather to make us all pause and breath for a second. All hope is not lost. As I started off, this midterm election, let FoxNews tell the story, was going to be with GOP gaining the House, gaining the Senate and taking their fair share of the governor’s mansions. (As of the publishing of this the Dems were still projected to maintain the Senate). Granted a number of the governor’s mansions switched to GOP hands, in most of those states, it’s not uncommon to see a Republican governor. That’s certainly the case here in Illinois. In fact during my lifetime, Illinoisians have only elected one Democratic governor prior to tonight (this with less than 10,000 votes separating the GOP candidate and frontrunner incumbent Pat Quinn with 93% of the precincts reporting). This is to say that the old adage “All politics are local” is still very applicable to this midterm election. Yes, it’s very hard to see GOP victories for most black people, but let’s remember, we survived the 2000 election between George W. Bush and then VP Al Gore, and we survived the ensuing eight years. We certainly can survive another two more. History has been on the side of the incumbent who’s party loses midterm elections: in 1982, the Republicans lost the House, but Reagan won again in 1984; in 1994 the Democrats lost the House, but in 1996, Clinton was re-elected. Granted that didn’t always translate into regaining the Congress if the opposing party was in the White House, certainly Bush had a Republican Congress for the majority of his reign administration. Election night November 2nd was a wake up call for me personally to realize that I live in a country that still cannot successfully maintain a diversity of persons in the U.S. Senate. Since Reconstruction, we’ve only seen four blacks in the U.S. Senate — three of which have been from Illinois. Granted this comes from blacks supporting blacks, the majority still comes from the collective will of the state’s Democratic party, which as we saw in the case of Kendrick Meek will actually hang you out to dry in certain cases. In a country that’s approximately 20% non-white, the Democratic party takes the black vote for granted, the GOP is delusional about getting blacks to be a part and the Tea Partyer’s are merely adverbs and nouns away from flat out saying “We don’t want you.” For now they’re settling on taking the scene from “Forrest Gump” when everyone on the bus tells him “Seat’s taken” with the characteristic southern dialectical twang. 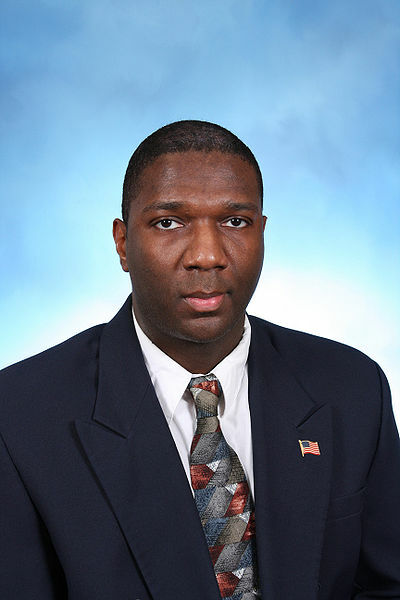 This weird play of the Democrats and the U.S. Senate went awry during the primary season when the “gump” of Alvin Greene made his appearance. Greene portrayed someone on the television screen with barely an IQ barely above what the psychologists of yesteryear would have termed “moron.” He was really a black version of Forrest Gump — barely functioning. And somehow this man made it onto the ballot and actually won the nomination! Still I don’t know what’s worse: him winning the nomination or that 28% of South Carolinians actually voted for him. All of this again begs the question as to what was really going on here with the Democratic National Party that allowed Alvin Greene to make it on a serious ballot, and that left a major party player coming in like a third party candidate down in Florida? I won’t perceive to know the answer to that. But I do know that all of this stinks to high heaven and seems like yet again more of the same politicking that royally abuses the electorate who with each passing year and vote grow more and more apathetic resulting in more and more “pinch your nose” votes just to retain the right to complain. We can certainly expect more off the wall comments concerning race and coded language from the Tea Party as they emerge forming a congressional caucus. Undoubtedly we’ll begin to see more and more acerbic rhetoric being spewed from the likes of probable Speaker of the House John Boehner and those on FoxNews. 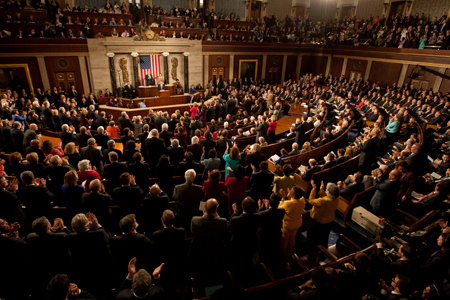 What we won’t see is a new GOP controlled House actually promote meaningful legislation. Sarah Palin just today got on various local radio outlets flat out saying that they are not going to cooperate with an Obama White House. Aside from the horrible attitude that promotes, she says that as though the House of Representatives carries the power to enact proposed legislation — and you need a 3/5th vote to override a veto, which the GOP does NOT have in either legislative body. A final point, one I stumbled upon earlier that I haven’t heard discussed much was that this was an election the Democrats couldn’t afford to mess up because of the census count that took place. This 112th Congress will have the pleasure of apportioning their districts according to population changes. This means that the ever popular gerrymandering will be in full effect. If you’ve ever looked at a political map and you noticed the weird boundary lines some of which may only be one block wide in some sections with two whole other districts on either side, then that’s the result of gerrymandering where the politicians in power get to determine political boundaries for the next ten years. This results often times in long term residents of a certain ward or district getting moved for the sake of politicking. Life goes on; the bills are still due; winter is still going to come; Obama will still be president tomorrow. What are you gonna do about it? Good luck America. You got what you voted for, and your inaction spoke volumes. Yes, our inaction when we go to the polls kills us each and every national election cycle!